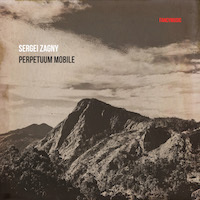 “Perpetuum Mobile.” Sergei ZAGNY: Perpetuum Mobile (1994-2016); Distributed Canon (2001-16); Perpetuum Mobile (Early Version) (1994); Perpetuum Mobile (Another Small Fragment) (2001-2016). Fancy Music FANCY083 (FLAC or MP3) (http://fancymusic.ru/). All told, there are close to two-and-a-half exceptionally chirpy hours here. Listeners unacquainted with minimalism’s history will quickly back away, but those who recall its origins will find Zagny’s clever reinvention mesmerizing. Realized at The Theremin Center, Moscow, using synthesized tones recalling the electronic age’s dawn, Perpetuum Mobile, Zagny’s minimalist four-voice study on cadential figures with wrinkles, takes 24:30 to unspool when all four voices are superimposed. Each voice is offered separately which may drive the unprepared to madness, except that the goofy unending melody really does bear exploring. It’s as if the arcade game has escaped the pizza parlor and sporting a new pair of wobbly legs now checks out the rest of the boardwalk. After establishing his pattern, Zagny toys with note durations, as if this were on a tape that could be slowed using simple finger pressure. A fadeout implies this could continue forever. The Early Version is more aggressive with the campy sine wave sound. It is slightly shorter (23:58), but I didn’t superimpose them to spy particular differences. Another Small Fragment is simply that, more of the same at a smaller scale. 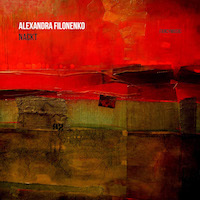 “NACKT.” Alexandra FILONENKO: Irreversibility of Mechanism (2014)1; Obsession (2015)2; Schattenspiel (2011)3; JACKSON(G) (2014)4; NACKT (2013)5. Vladislav Pesin1 (vln), Konstantin Manaev2 (vlc), Roman Yusipey3 (accordion), Grigory Krotenko4 (cbs), Daniel Gloger5 (c-ten), Alexey Nadzharov1,4, Alexandra Filonenko2 (electronics). Fancy Music FANCY075 (1 CD) (http://www.fancymusic.ru/). Confidently following the signposts out of the Lachenmann universe, Filonenko’s invigorating pieces contain intense moments that combine electronics, instrumental extended techniques and vocalizations, channeling disruption into expressive energy. The violinist in Irreversibility of Mechanism must gasp and confront electronic echoes, noise bursts and sirens. Obsession seems not to ask the cellist for vocal effects, but the instrument spends much time playing sul ponticello or scratching. The cello’s grinding contrasts against a lax hi-hat riff on tape, as two clichés battle it out. The chords in Schattenspiel surprise because the accordion is treated against type providing mostly single pitch gestures, held notes or rapid whorls. JACKSON(G) includes recitation, and here it is unclear whether it is the bassist, or an actor pre-recorded on tape. The answer may be found on Filonenko’s website where a photo shows this performer leaning into a microphone while holding his instrument. NACKT lurches between speaking and singing. How can a single countertenor achieve so much? None of these are easy feats. Félix-Antoine MORIN: Le jeu des miroirs de Kali (2013-17). Kohlenstoff KOHL038 (1 CD) (https://kohlenstoffrecords.com/). Two 20:57 + 20:30 sections of ea provide an alluring composite travelogue to places on the Indian subcontinent. Morin is an astute collector and assembler. Faraway places are precisely described, but with artistic license. Electronic swells and bold pedal points appear towards the end that may not be derived from the field recordings themselves. These intrude lightly across the frame of the exotic chants and processions, the river Ganges, and bells. 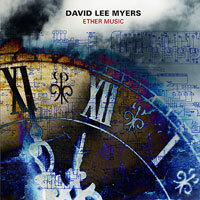 “Ether Music.” David Lee MYERS: Var. comps (2015). Starkland ST-227 (1 CD) (http://www.starkland.com/). For this release, as has been true across Myers’ career, the composer uses purely studio-generated content or feedback from electronic devices as a starting point. Nothing we hear comes from the outside world, it all originates from specifically designed or configured electronics. Some tracks were created realtime (connections between electronic sources, processors, and mixers handled live) while others were built-up in the studio from multiple sessions. The results perch between antique and contemporary, like a well-lit room outfitted in mid-century modern. Chattering and clicking may suggest rainforests or arcades à la David Tudor (Implicate Order, Astabilized). The bubbling sounds in Rigid and Fluid Bodies suggest lava lamps, but the crisp focus could only be present-day. Timbres range between thin sines to plush ring modulation (e.g. : What’s Happening Inside Highs and Lows, Arabic Science, Radial/Axial). On Growth Cones you can practically hear the sliders changing the pitches. It did suggest those strange recordings of shortwave numbers stations. The Dynamics of Particles and Royale Polytechnique celebrate the rhythms they produce. The final track and also the longest, Dorsal Streaming, caps the program as a soothing, elevated summary. “Bonsai.” Zeno BALDI: Bonsai (2017)1; Cantor Dust (2013)2; Kintsugi (2015)3; In Punta (2013)4; Mimo (2014)5; Morene (2016)6. 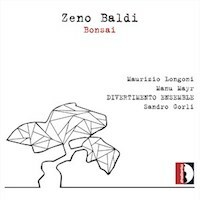 Maurizio Longoni3 (clar), Manu Mayr6 (cbs), Divertimento Ensemble1,2,4,5, Sandro Gorli (cond.). Stradivarius STR 37101 (1 CD) (http://www.stradivarius.it/). Despite his age and generation, Baldi (b. 1988) incorporates tape and electronics like a master. Even though half these six pieces add an electronic element, the continual mutations reflect fluency with technology. In the title piece, Bonsai, a small ensemble (flute, clarinet, percussion, violin, viola, cello and bass) penetrates a changing electronic background to varying degrees. Fractals determine the motion in Cantor Dust (bassoon, horn, trumpet, trombone, percussion, bass), and the intrinsically different timbres fuse and comment upon each other. Generally, Baldi avoids instruments’ traditional characteristics: Long string notes or bold brass fanfares are not common. In punta (flute, clarinet, piano, violin, cello) extends the imagery of a Sanguineti poem. Its delicate activity occurs “in punta,” or “on the tips.” For Mimo (clarinet, piano, violin, viola, cello) players produce sounds inspired by their ensemble mates and there are modest piano preparations. Kintsugi (clarinet and tape) alludes to the Japanese art of repairing broken pottery with glue or lacquer containing silver, platinum or gold, thus emphasizing the break and the repair. The tape masterfully blends long and short gestures as the clarinet elicits extended sounds while emerging and retreating. The final piece is the most astonishing. Morene for amplified bass and effects pedals comprises three movements (Triti, Ritriti, Detriti) which reference the accumulated sediments of glaciers. Repetition and amplification transform the stringed instrument into a printing press or radio static. 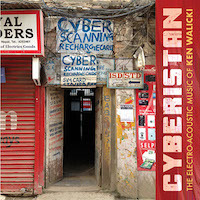 “Cyberistan.” Ken WALICKI: Light (2009)1; Black Water (2010)2; Sabah (2003)3; Cyberistan (2014)4; nada Brahma (1997)5. Tom Peters1 (cbs), Virginia Costa Figueiredo2 (clar), Füreya Ünal1,4 (pno), Rachel Mellis3 (fl), Eclipse Quartet5: Sara Parkins, Sarah Thornblade (vln), Alma Lisa Fernandez (vla), Maggie Parkins (vlc). Ravello Records RR7974 (1 CD) (http://www.ravellorecords.com/). Across five engaging pieces, Walicki offers contrasts. Light counters the presumption that the bass is a low-pitched supporting instrument. Alongside the bass’s alternately flowing lines and rhythmic forays, the accompanying electronics manipulate stringed instrument sounds with bold sweeps. Black Water adds computer and slide show to clarinet and piano. The consonant and bright results mask the title’s allusion to a private mercenary army and that this piece is about the 2010 Deepwater Horizon spill. Its title indicating the Turkish word for mourning, Sabah for flute and tape intends to turn the corner from grief onto optimism. Where others might contrast the flute, Walicki prefers a smooth treble background that could be synthesized strings or other flutes. The release’s title track for piano, computer and video saunters casually as the piano moves though predominantly simple patterns. 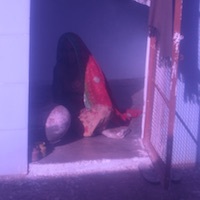 Cyberistan signifies a world blessed with the most optimal Internet connection, yet the music proceeds at a walking pace. Its grungy aura suggesting a rock band’s discarded accompaniment, nada Brahma most definitely was commissioned by the Kronos Quartet. We are to witness that the world is sound, and that many world religions started with sound. After so many pop music rhythms and e-guitar emulations, the last third lands unexpectedly on a viola threnody. “Fancy Colors.” David TADDIE: Wayward Country (2017)1; A Rift in Time (2001)2; Triptych (2014)3; Tracer (2003)4; Category 5 (Echoes) (2011)5; Caterwaul Dreams (2006); Licorice Stick Groove (2009)6; Convergences (1995)7. Michael Ibrahim1 (a-sax), Andrea Schultz2 (vln), Michael Finckel2 (vlc), Nina Assimakopoulos3 (fl, voice), Keith Kirchoff4 (pno), Francesca Arnone5 (fl), Mikylah McTeer5 (vln), Marianne Gythfeldt6 (clar), Julia Kay Jamieson7 (hp). Ravello Records RR7986 (1 CD) (http://www.ravellorecords.com/). In this collection, electronics bring colorful and vibrant backdrops to instrument activity. The longer pieces’ varied sections offer many facets: A Rift in Time magnifies violin and cello with electronics; flute (and piccolo) plus violin balance computer in Category 5 (Echoes); and Licorice Stick Groove pairs clarinet and tape. 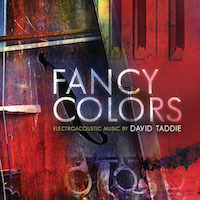 Taddie samples the instrumentalists and transforms them extensively for the accompanying electroacoustic part. His confident designs do not crowd the frame: Tape or instrument(s) may play singly or in combination. Tracer’s frisky piano arabesques and harmonies suggest Messiaen. Because its perky electronics recall DX7 presets, Convergences for harp and tape slightly suggests its age. The briefer pieces also reward: Wayward Country supports alto sax with computer, Caterwaul Dreams is the sole piece for tape alone wherein Taddie imagines what occurs inside a slumbering cat’s mind. With flute and a tape containing whispered speech, Triptych just barely avoids self-parody through tight interrelationships between text (provided by the flutist) and sound. 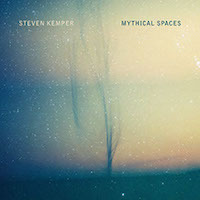 “Mythical Spaces.” Steven KEMPER: Mythical Spaces (2010)1; Breath (2015); Lament (2015)2; In Illo Tempore (2012; rev. 2017)3; The Seven Stars (2012)4. Mike Truesdell1 (perc), Wayla Chambo2 (fl), David Wegehaupt3 (sax), Dana Jessen3 (bsn), Aurie Hsu4 (pno). Ravello Records RR7980 (1 CD) (http://www.ravellorecords.com/). Mythical Spaces asks for wooden and metal bowls to be amplified as they are rubbed, and pre-recorded sounds made using dirt and water. Purely electronic sounds appear in the work, but what sounds like spilling soil or steaming water unsettles the percussionist’s actions. I could imagine a version for tape alone, or one where the percussionist stays away from anything pitched. Breath, a brief tape-alone piece, satisfies this request, transforming sounds made by the composer. In Lament, flute blends with electronics and a poem written by and recited by the flutist. [Why does it seem all pieces for flute and electronics include poems or texts?!] Juxtaposing Monteverdi, saxophone, bassoon, and two invented robotic instruments, In Illo Tempore looks forward and back. The winds’ rapid note punching halts the wheezy electronic pace over harmonies borrowed from the 1610 Missa. Perhaps sax and bassoon could have been balanced further forward. Avoiding routine prepared-piano gestures, the short movements of The Seven Stars (named for stars in the Big Dipper) investigate permutations of seven through edgy amplification.